MasterChef Junior is no longer appointment television—which is a weird phrase to use when most people watch television whenever it shows up on the Internet, but it will have to do as a shorthand. There just isn’t the same level of excitement surrounding this third season. Part of this comes from viewer fatigue, since this season began almost immediately after the last ended, but there’s definitely a sense that the show itself is fatigued, too. Take tonight’s challenges. The first is in the “do as many as you can” genre, tasking the kids with blowtorching as many crème brulees to perfection as possible. Andrew tries a “more is more” approach, taking a blowtorch in each hand like a Clint Eastwood character drawing on a yellowbellied coward—but he still only ends up with four acceptable desserts. Jenna also ends up with just four, since her early attempts left the crèmes barely brulee’d. Jimmy guesses that he has five perfect desserts, but he ends up with eight and the advantageous win. Nathan, however, only gets credit for one. When the judges set the challenge, Nathan says in a talking head interview that he’s never eaten a crème brulee before, because he’s never really eaten at many “fancy restaurants” in San Diego before. He later says he’d like to win because his family is “not the richest,” and while he plans on using the $200 in his savings account to help out, he’s pretty sure the grand prize of $100,000 will help more. It’s…well, heartbreaking. The question of class has never really been addressed on this show. 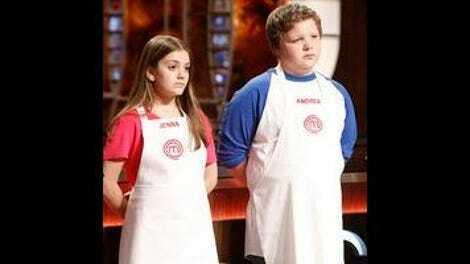 There have been times when some contestants’ background is more evident than others, like when they say a family member owns a restaurant, or that they got to try an obscure dish at their birthday dinner, or that participating in MasterChef Junior will be a nice footnote for their college application (looking at you, Samuel). Meanwhile, the kids without access to people who can teach them how to sear a perfect scallop or take them to those “fancy restaurants” are at a distinct disadvantage—especially for a challenge that forces them to recreate a “high end” dish. This brings us to the underwhelming semifinal challenge. I’m never very interested in the challenges that just make the contestants recreate existing dishes. Part of the fun with cooking shows is watching people adapt to tough circumstances and get creative with unusual ingredients. It’s far less interesting to watch chefs follow a recipe to the letter. This holds especially true for MasterChef Junior, which has always been at its best when highlighting the kids’ expansive imaginations. I’m just not invested in seeing whether they can mimic; I’d rather see them create. But mimicry is the name of the game this week, so let’s talk about this raspberry challenge. After the kids get pelted with raspberries from above in the style of Nickelodeon’s green slime, Jimmy doles out the assignments. The tricky raspberry tart goes to Nathan, who Jimmy see as his biggest competition. He then gives the mousse to Andrew, thinking that his oversized personality in the kitchen will clash with the dish’s simplicity. Finally, the Napoleon goes to Jenna. Jimmy says with wide-eyed innocence that he assigned Jenna the Napoleon because it’s the easiest one, and also: “she’s my friend and I don’t want her to go home, but I definitely think I can beat her in the finale.” It has the guise of friendliness, but having the foresight to try and get who he views as the weakest contender into the finale with him is startlingly shrewd gameplay from an otherwise innocuous kid. By the time Andrew ambles up to the judging table, his apron looks like he’s been, in Gordon’s words, “paintballing with raspberries. Look at you.” Since the actual cooking process of the challenge is largely defined by Gordon making a stink about how sweet Andrew’s mousse was when he tried it, it’s no surprise when MasterChef Junior’s typically languorous editing stretches the moment of truth out as long as possible. Since there has rarely been a cut to commercial where Ramsay starts out “it is absolutely—” that didn’t end with “delicious,” though, Andrew is safe. He and Nathan move on to battle each other in the finale, while early frontrunners Jeremy and Jenna are sent home. I’ll be honest: I had trouble keeping my attention focused during this episode. Again, recreation is a boring angle for a cooking show to take, and the fact that MasterChef Junior went with this angle for a semifinal is disappointing. It leans entirely on technique. Andrew can talk about putting himself on a plate all he likes, but this episode didn’t give any of them room to do that at all. As the others wait for the final judging, Andrew wrings his hands and smushes his head on his cooking station. This, combined with “it’s pretty cool that we get to, like, burn things” confirms for me that Andrew is very endearing. My friend Dylan described him as “the catcher in every kids’ baseball movie,” which is perfect and I will hear no arguments to the contrary. Nathan on heading to the finale: “I’ve been dreaming about this moment ever since Masterchef Junior was invented.” So…a little under two years? “I’m the only girl left, which I think is kind of crazy, because I think girls are better than boys.” “I want to win for the girls, and for New York.” Aw, Jenna. Yes. The commercial for the new American Girl movie (#MCJAmericanGirl) was…something! American Girl Grace competes on MasterChef Junior, possibly flirts with boys in the fruit section of the pantry, probably will be the first female MasterChef Junior, is definitely fictional.